Cooking was a huge part of Gina’s upbringing. Basically a quiet child, both her grandmother and mother taught her the “ins and outs” of a kitchen. Originally from Montgomery, Alabama, Gina is the fifth of seven children, and her parents have been married for 50 years. Leaving the stability of this large family, Gina came to Charlotte six years ago looking for more professional opportunities. Gina says that the majority of her work history is tied to her two passions: cooking and children. Prior to enrolling in CCSC, Gina worked as a childcare provider for over 20 years. Gina learned about CCSC’s training program through Mecklenburg County DSS, where she received Food Stamps. After being laid off from her last daycare position, Gina worked a variety of jobs, including concession stands at Time Warner Cable Arena and the Carolina Panther’s Bank of America Stadium. One challenge that Gina faced was math competency. Through tutoring and discipline, she gained math skills, which are especially needed for working as a baker! She feels that her current job is definitely a “calling” – she’s the only baker at the Goodwill Industries’ Community Table Bistro. When she graduated from CCSC, she had two interviews on the same day, and got job offers from both of them! Gina has had no regrets about pursuing a career in the culinary arts. The reason she loves baking – seeing the smiles on her customers’ faces! Gina has been employed by the Bistro for about two years, and she has already made some great strides within the organization. This can be seen by her continuing to move forward to advance financially and in gaining more responsibility. In addition to the Bistro, Gina is now making baked goods for other Goodwill locations. Gina is passionate about giving back to her community, as evidenced by her donating baked goods and food products to Charlotte-area homeless shelters. 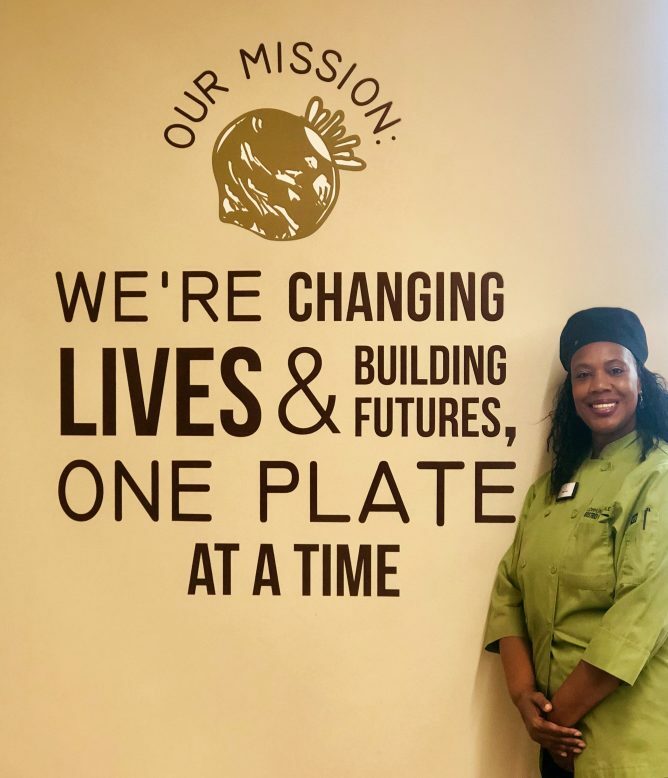 If she could give CCSC’s current students any suggestions, Gina would tell them “take all of the tools offered by the chefs and other support staff extremely seriously. Because once you enter the “real world” of employment, you will need all of the patience, perseverance and discipline required by our program, to make it”. Gina appreciates “the guidance of all the staff at the School that truly helped to mold me into the person I am today, achieving the success that I am presently experiencing.” CCSC is proud to call Gina a graduate of our program and wish her the best in all her endeavors!